Description: This bridge rises to a height of 243 feet above the shipping channel of Corpus Christi. The clearance under the bridge is 138 feet. There are a total of six lanes of traffic that cross the bridge. If you are brave you can cross the bridge using the pedestrian walkway that is squeezed in alongside the guard rail. Location: Where US 181 crosses over the Corpus Christi shipping channel. Operating Seasons and Hours: Open all year long - but probably not very fun to cross during rush hour. This was the first stop on the third day of the Texas Coastline Road Trip that my husband and I took our kids on in November of 2014. We left the Port Isabel Park Center RV Park and drove north for 170 miles to reach Corpus Christi. 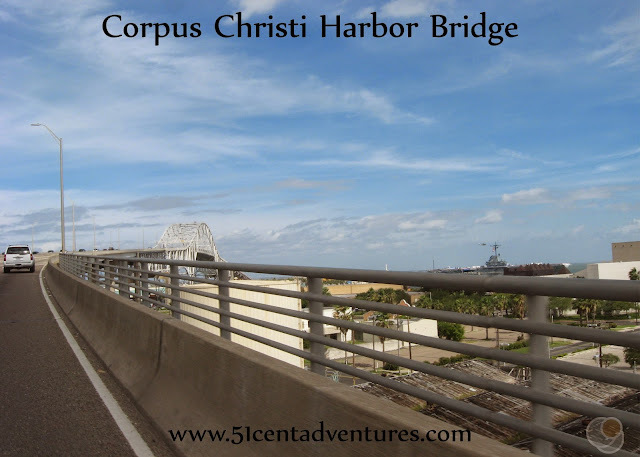 I'd read about the Corpus Christi Harbor Bridge in my Texas Guidebook. What caught my eye was a sentence that said there was a pedestrian walkway on the bridge. The guidebook mentioned that walking across the bridge was a popular activity. That sounded kind of interesting, but I wasn't sure if it was something that my young children would enjoy. "The pedestrian lane is a 24-inches-wide concrete strip. On your left is a 3-feet-high concrete wall separating you from the 60 mph traffic. On your right is a 4-feet-high steel guardrail separating you, at the summit, from a 240-feet drop. Loud traffic whizzes by. The bridge sways from the high winds (20 mph when I walked it)." Yep, I certainly wasn't going to try to walk across this bridge with my kids. But that didn't mean we weren't going to check it out. The bridge is, after all, one of the city's major icons. 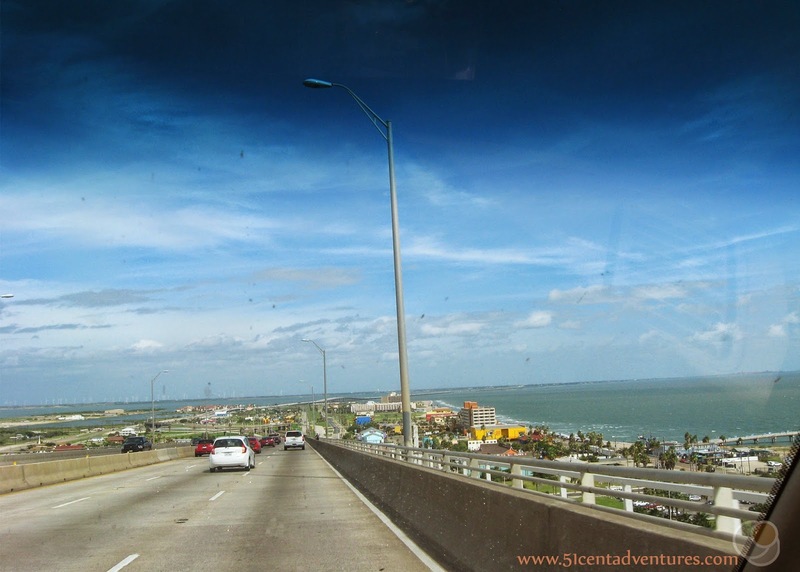 When my family arrived in Corpus Christi we headed to the bridge first. The thing that surprised me the most about the bridge was the steepness of the road that led to the summit. Most of the online pictures of the bridge only showed the actual bridge part of the road. They don't show the steep sides that take the road from a few feet above sea level to 138 feet in less than half a mile. I guess I'd assumed the bridge would be flat. I forgot that it would have to be tall so ships could pass under it and reach the shipping channel. Going down the other side was just as steep. My kids thought that driving on this bridge was really fun. They screamed like they were on a roller coaster. 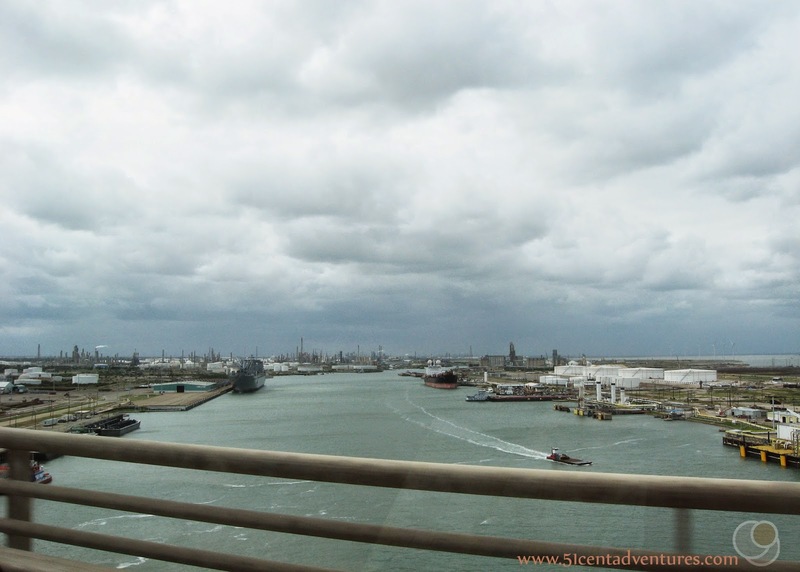 The bridge gave us a great view of the Corpus Christi Bay. We could see the USS Lexington Aircraft Carrier in its permanent resting place in the harbor. The Corpus Christi Aquarium was also visible from the bridge. We stopped to play on the beach for an hour or so and then went across the bridge again. Traveling south gave us a great view of the shipping channel. My kids loved driving on the bridge. 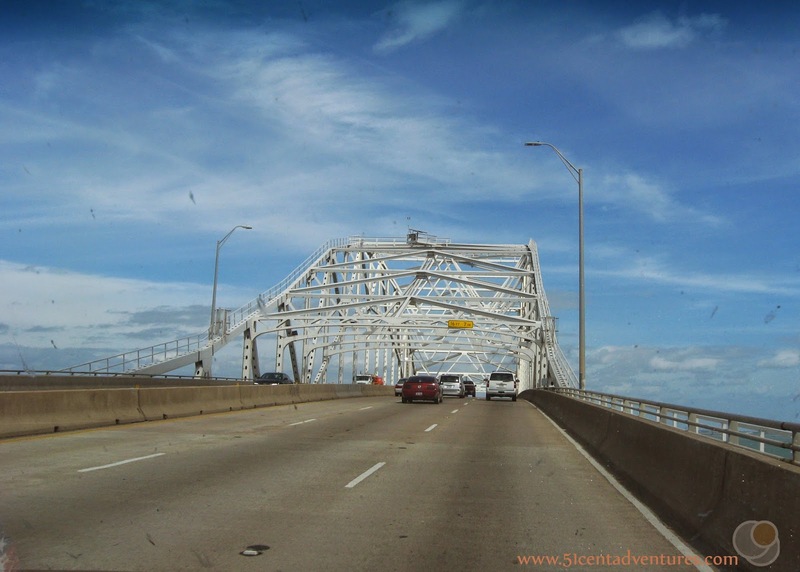 We would drive on many more bridges during our vacation. Our kids screamed with excitement on every bridge we crossed. Even our one year old learned to scream along with the big kids. If you want to walk across the bridge you can do so at any time. One the first Sunday of every month a group of local residents gets together to walk or run across the bridge as a group. I think that if I was going to walk across the bridge I'd like to do it with a group. Then it would seem more like a activity rather than like I didn't own a car. You can find out more about the fitness walk at www.bridgewalkcc.com. Recommendation: A visit to this bridge is a must if you are visiting Corpus Christi. Crossing the bridge on foot; however, is up to you. Directions: The bridge is located north of downtown Corpus Christi. And is very easy to get to. It is part of US 181/Highway 35. Additional Information: I didn't realize that this bridge is old and outdated. Construction was begun in 1956 and finished in 1959. There are plans to replace this bridge with a new one by the year 2020. The current bridge has a clearance of 138 feet tall. The new bridge will have a clearance of 205 feet. There will also be more lanes to accommodate more traffic crossing the bridge. Read more about the project here: http://ccharborbridgeproject.com. 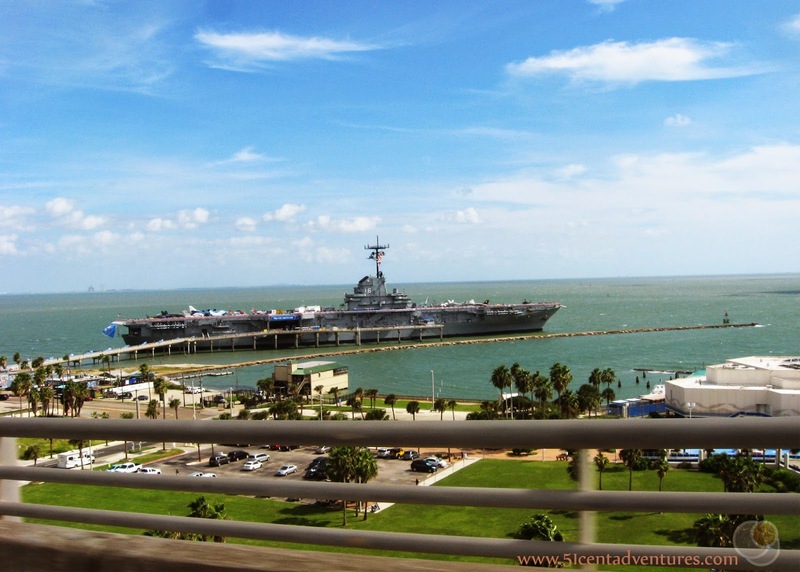 Places Nearby: The USS Lexington, which is visible from the bridge, was on my list of places to visit during this trip. My husband and I were planning on visiting it after our stop at the beach. However, we decided that the price was a little too much for us. Regular Adult Price is $13.95. We would have paid $11.95 with our military ID's. Tickets for children ages 4-12 are $8.95. Our twins had just turned four so we would have had to pay for them. On the one hand I felt like touring an aircraft carrier was a unique enough experience that it would be worth paying $40 to visit it as a family. But on the other hand I didn't want to pay that kind of money, and then have my kids freak out below deck. So we decided against taking the tour on this trip. It actually turned out just as well. 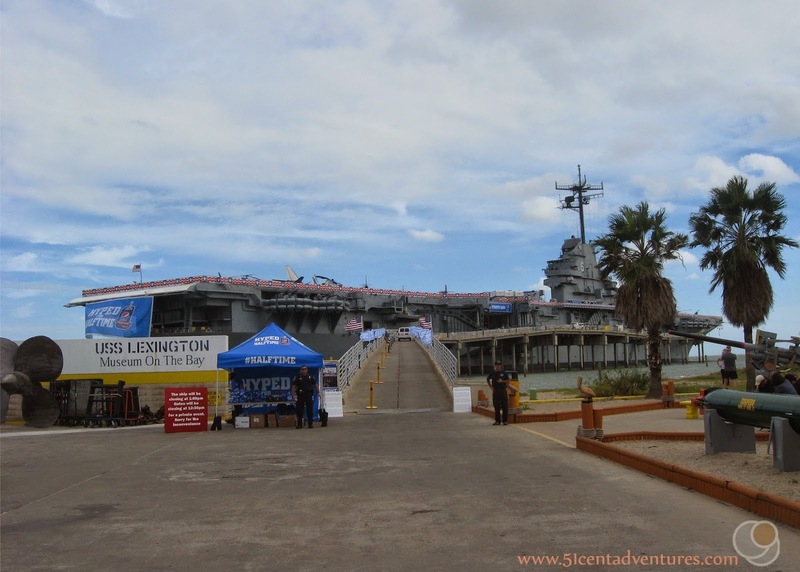 When we drove by the USS Lexington to take some pictures we discovered that it had closed early that day. There was some sort of private event going on, and so we wouldn't have been able to take a tour anyway.